Hockley Golf Club’s Logo is the ‘Trusty Servant’. Some have thought that it was a fox, but in fact it is a “hircocervus”, or “goat-stag”. The association of the Golf Club with the Trusty Servant is due to the close links of the Club with its landlord - Winchester College. 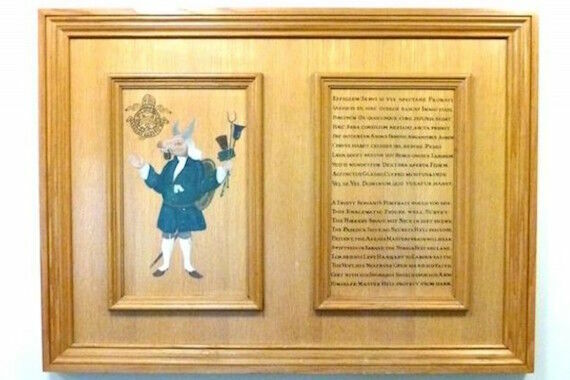 A reproduction of an image of 'The Trusty Servant' that was painted on a wall outside the kitchen of Winchester College by John Hoskins in 1579 is shown at the left. The painting had a dual function: it is accompanied by allegorical verses that associate the hircocervus servant's various animal parts with distinctive virtues that the college's students were meant to follow. This figure well survey, who'ever you be. Himself and master he'll protect from harm. A portrait of the Trusty Servant, painted in 1809 and still hanging just off Chamber Court at Winchester College. British Printed Images before 1700.